This edition of Global From Asia’s E-commerce Gladiator, show 43, we are recording in Bangkok, Thailand. 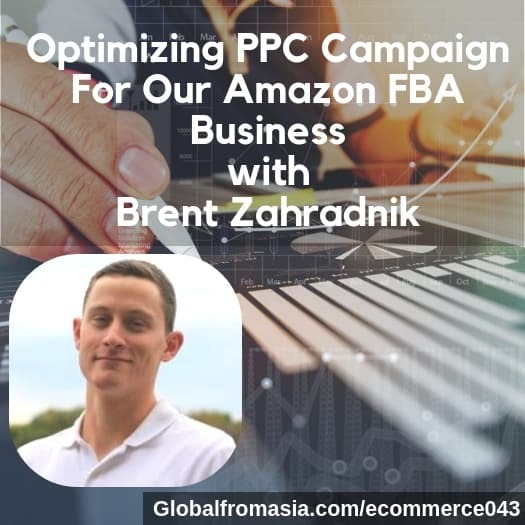 Brent Zahradnik founder of AMZ Pathfinder, a PPC agency focused on Amazon Europe comes on the show with Mike and Marc. Another fun fact – Marc and Mike just met in person for the first time before the recording and this was done in person at Mike’s Airbnb “Studio”. Ok enough of the behind the scenes, today’s show we have a mix of updates at Para Living / Sisitano as well as really amazing nuggets of knowledge from Brent, let’s tune in! What are some differences and similarities between the two – especially with all the changes Amazon has been making. Marc discusses about some issues he has with gated keywords and Brent shares why it might be. Marc prefers buying existing businesses. Brent shares about targeting an ASIN. Brent talks about the new headline search. Do we need Amazon PPC? Brent shares some insights from the data he has been seeing working with many PPC clients. What are some of the differences Brent sees since he started doing Amazon in 2014. Is it still possible to get started today? There you have it – PPC is an essential for Amazon FBA – and many predict it to grow more and more like Google adwords and Google advertising in general. Thank you Brent for coming on the podcast- can you believe he hasn’t been on other podcasts!? We need to get him on again, a wealth of information for Amazon PPC and Europe – so stay tuned and I wish you the best with your business journey.